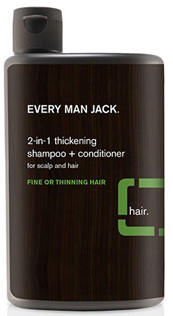 2 in 1 Thickening Shampoo & Conditioner, 13.5 oz (Every Man Jack) - Penn Herb Co. Ltd.
Gently cleanse and moisturize your hair and scalp while removing excess oil and build-up. Coconut-derived surfactants clean hair while Glycerin and Shea Butter condition and soften. Soy proteins fortify hair from root to end. Leaves hair stronger, thicker, and fuller. Water, Ammonium Laureth Sulfate, Sodium Coco-Sulfate, Glycol Stearate, Decyl Glucoside, Glycerin, Cocoamidopropyl Betaine, PEG-150 Distearate, Tocopheryl Acetate, PEG-30 Castor Oil, Aloe Barbadensis Leaf Juice, Mentha Piperita (Peppermint) Oil, Rosmarinus Officinalis (Rosemary) Leaf Oil, Pyrus Malus (Apple) Fruit Extract, Camellia Sinensis Leaf Extract, Lavandula Angustifolia (Lavender) Flower Extract, Geranium Maculatum Extract, Echinacea Angustifolia Extract, Saccharum Officinarum (Sugar Cane) Extract, Citrus Medica Limonum (Lemon) Fruit Extract, Butyrospermum Parkii (Shea Butter), PEG/PPG-4/12 Dimethicone, Guar Hydroxypropyltrimonium Chloride, Polyquaternium-7, Hydrolyzed Keratin, Hydrolyzed Quinoa, Hydrolyzed Soy Protein, Betaine, Amodimethicone, Panthenol, Hexylene Glycol, Hexapeptide-11, Trideceth-12, Cetrimonium Chloride, Menthol, Citric Acid, Phenoxyethanol, Benzyl Alcohol, Fragrance/Parfum. No parabens, no phthalates, no dyes, no sodium lauryl sulfate, and never tested on animals.